Nine years ago 2010, we supported our fundraising campaign "66 posts", to build a new enclosure for the bears. Now the donations will be used to feed the bears. Right now eight bears live in the bearorphanage and they need a lot of food! Brown bears eat seven kilogramms fresh fruits, vegetables, herbage and nuts a day. Veterinarian-, enclosure- and electricity charges must be added too. With ten Euros you can buy a foodbox, which means enough food for one bear for one day. So "Dobar Teg" ("good appetite"). 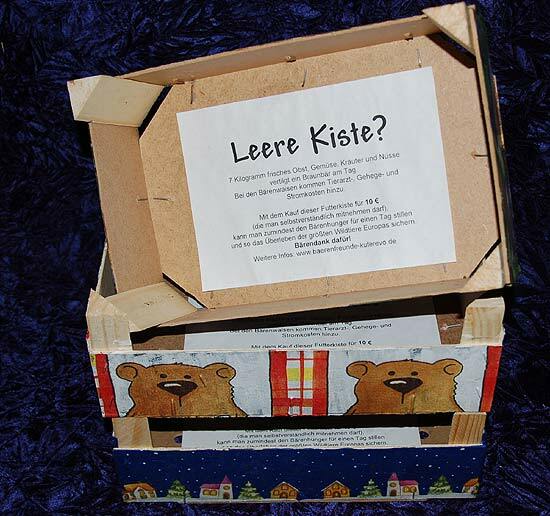 If you like, you may pick up your box in Leinfelden-Echterdingen personally. The donaters names, location and donation will appear on our homepage. Our first aim is 20 food boxes. Every sold box disappears and behind it a bear photo is hidden.